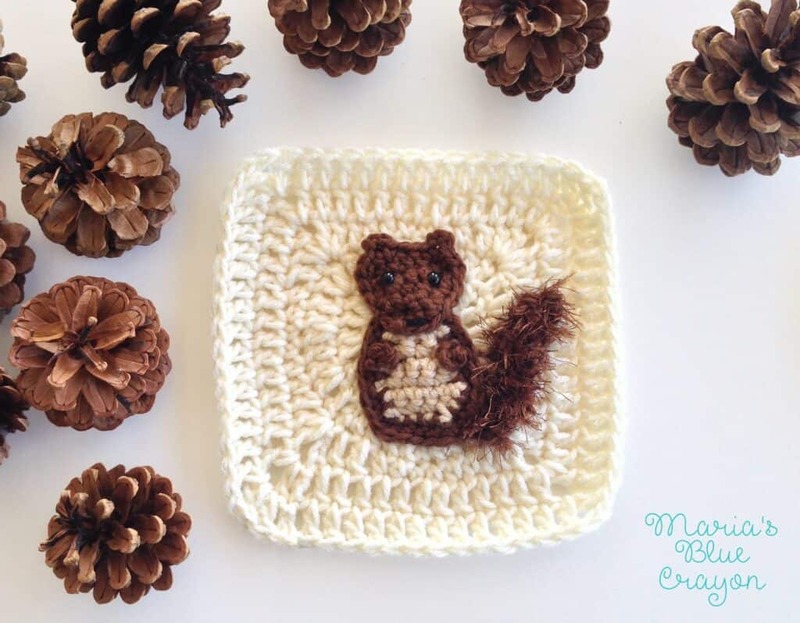 GET THE CROCHET SQUIRREL APPLIQUE ALONG WITH THE GRANNY SQUARE PATTERN IN AN AD-FREE PDF DOWNLOAD HERE. 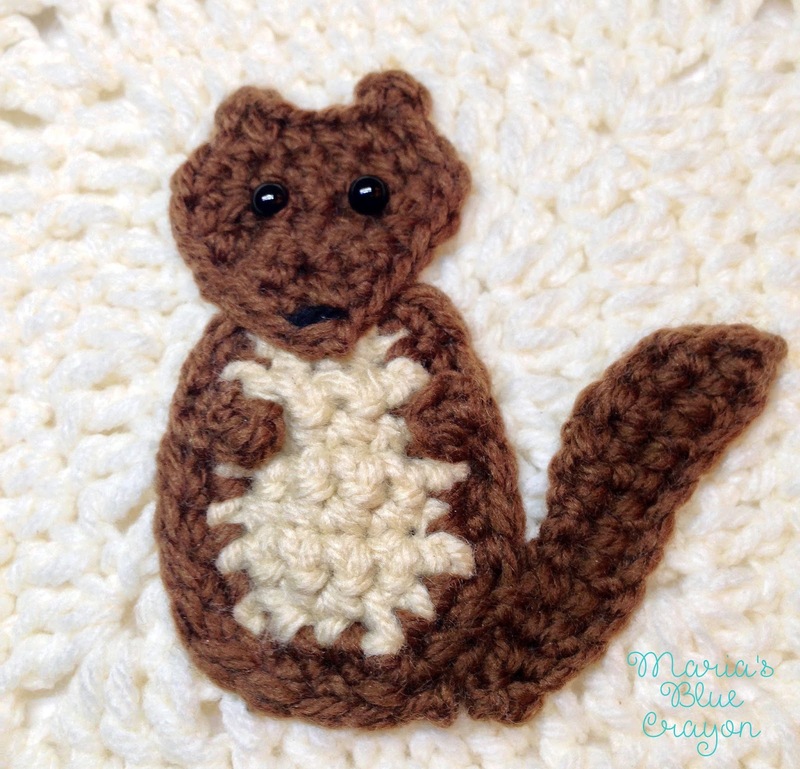 OR SCROLL DOWN FOR THE FREE SQUIRREL CROCHET PATTERN. The squirrel has made it to the Woodland Afghan! It’s been tough picking only ten animals, but I needed a realistic goal for this blanket. I planned for this blanket to be finished by the time March rolls around, but here we are! It’s March! And this thing is still going! The squirrel is my seventh woodland themed granny square, and only THREE more to go! I have been getting requests and messages about animals people would like to see appear on the afghan. I have my animals picked and set for the last three, but I’m thinking I may just have to visit this afghan in the near future to add additional squares that are most requested! So if you have been hoping for a certain animal that I haven’t already created or on my list to design, let me know! If an animal is requested enough, I will come back and design it for an extra square option. Now that you all know the plan for the rest of the afghan, let’s get to the squirrel pattern! As always, the pattern for the Granny Square is here where you will also find the running list of squares designed, what colors are needed for the base of the squares as well as what the overall pattern of the blanket will look like. There are two pattern options for the tail: one option is using the fun fur yarn and the other option is using the toffee colored yarn. Both options are written below. *If you use the later option, the fun fur yarn will be optional. I made the fun fur optional mostly because I personally couldn’t find this particular color in stores anymore, and I only had it from my yarn stash. The safety eyes on Amazon are the cheapest I have found. You can get them at the craft store for about $3 for 10 pieces, but on Amazon you can get 100 for only a little over $6. Definitely worth it if you make amigurumi, and you will also need several for this woodland afghan project. Also, Clover hooks are amazing especially when working with smaller hook sizes. I listed the two hooks you will need for this project, but you can get a whole set of ten for about $40 – that is super cheap for these hooks! Chain 1, SC around until you get back to row one (top of the head). 2 SC into first stitch of the row, in next stitch work the following (SC, chain 3, SC), SC into next two stitches, then work the following in the next stitch (SC, chain 3, SC), 2 SC in the last stitch. This makes the ears and the top of the head. Continue to SC around until you get back to the bottom tip of the head. Join. Fasten off and leave tail for sewing onto body. Using 6mm safety eyes, place the eyes onto the head. Using a tapestry needle and black yarn, sew on the nose using a running stitch at the bottom tip of the head. Holding the fun fur and the toffee yarn together, attach to where you fastened off the body. Sew the tail onto the left side of the body for 3 stitches. Chain 4, join to first chain. This is what the alternative tail is if you would like to opt out of the Fun Fur yarn. This squirrel square is the cutest thing I have ever seen. It has convinced me to start this project. I love everything about this afghan!! You do amazing work!